Daiitoku Myōō is meant to be intimidating. He is also known as the Wisdom King of Awe-Inspiring Power, and it is his job to defeat evil. 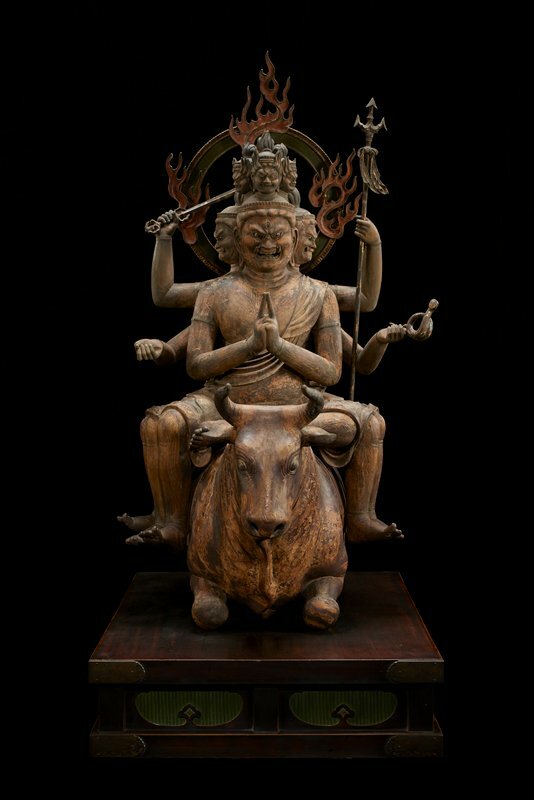 This Buddhist guardian deity’s intense rage is manifested by his wild appearance: six legs, six arms carrying an assortment of weapons, and six glaring faces backed by a halo of flames. Daiitoku Myōō does not act alone but is one of the Five Great Wisdom Kings (Godai Myōō). Four of the Wisdom Kings guard the cardinal directions surrounding the central fifth king. Each of them also guards its own buddha. Since Daiitoku occupies the west, he is associated with the wrath of Amida Buddha, whose abode is a paradise known as the Western Pure Land.